Delight in the formal grace of a grand New England-style yacht club at this lakeside hotel. Relax in the inviting elegance of a plush lobby replete with nautical touches, explore the whimsical Stormalong Bay and rent a variety of watercraft from Bayside Marina. Disney’s Yacht and Beach Club Resort is walking distance to Epcot and a convenient boat ride to Disney’s Hollywood Studios. Call 1-407-939-4686 to make your room reservations now. Be sure to mention that you’re part of the HortySpringer group to get the discounted room rate of $325 per night. With an unparalleled number of theme parks, opportunities for fun abound in Orlando. 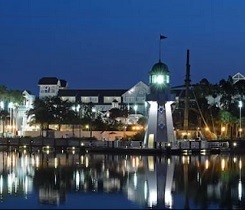 Walt Disney World — Click here for more information about Disney’s Yacht Club Resort, how to take advantage of Disney’s Magical Express, or to purchase discounted theme park tickets.